Adding colorful flowers along with a tidy clump of slender, round leaves to the garden, chives (Allium schoenoprasum) grow anew from underground bulbs each year. Growing in U.S. Department of Agriculture plant hardiness zones 5 through 11, chives grow from seed, from transplants or by dividing clumps. Grow chives in the herb or vegetable garden, as a container plant or in edgings or borders. You can begin to harvest chives after the plant is 12 months old from seed, and divide clumps when they're about 3 to 4 years old. Chives start easily from seed and often seed themselves in the garden. Sow seeds in place after the danger of frost has passed. Choose a sunny spot with fertile, well-draining soil rich in organic material. Sow seeds 1/4 inch deep and about 2 inches apart, firming the soil over the seeds and then watering the sown area thoroughly. Thin seedlings to 4 to 6 inches apart. About six to eight weeks before the last frost for your area, plant seeds in 6-inch pots. Use pots that have drainage holes. Wash the pots in soapy water, rinse well, and then soak them for five minutes in a mixture of 1 part household bleach to 9 parts of water, rinsing again. Fill the dry pots with a soilless mix, such as equal parts of peat and perlite, to within 1 inch of the rim. Sow the chive seeds 1/4 inch deep and 2 inches apart. Water and place the pot in a sunny window. Keep the soil moist but don't allow it to stay soggy. Transplant chive seedlings when they're about 3 inches tall to individual 3-inch pots. When all danger of frost has passed, transplant the seedlings to the garden. Amend the soil with organic material such as aged compost if needed before transplanting. Spread a 2-inch layer over the bed and dig it in. Get the chive seedlings used to garden conditions over the course of a week or two, leaving the pots outdoors for an increasing number of hours each day. Dig planting holes a little larger than the seedling pots, keeping the same soil level. Firm the soil around the roots. Space seedlings 8 inches apart. Water the transplants thoroughly, keeping the plants moist until they are well rooted, usually several weeks. In most places, chives grow in partial shade but flavor and growth form is best in sun. If summers are hot where you live, plant the chives in partial shade. 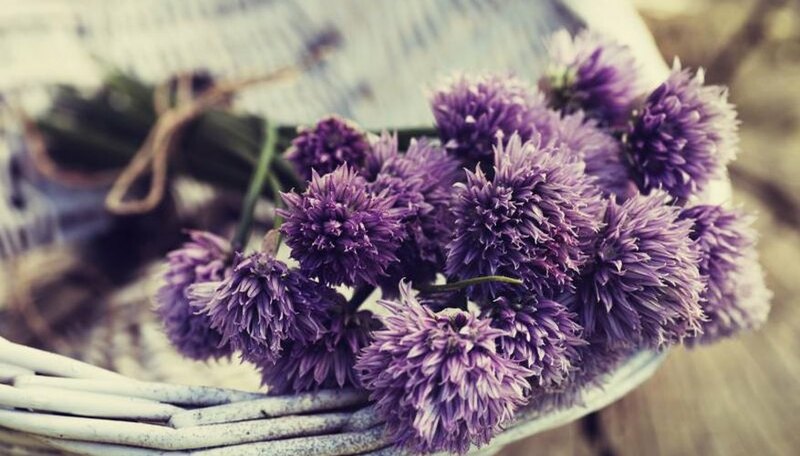 Limit your chive harvest the first year after seeding or transplanting. Cut off a few outer leaves to about 1/2 inch above the soil. Plants 2 to 3 years old withstand larger and more frequent harvests, up to every two to three weeks. Avoid cutting all the leaves off, which limits future plant growth. More leaves grow if you pinch off the flowers. In either spring or fall, dig up crowded clumps of chives and divide them into smaller sections, replanting them in the garden bed or in containers with drainage holes at their original soil depth. Water the transplants regularly to establish new roots, keeping soil moist but not soggy. For spring divisions, you can harvest the same season. Chives don't need much fertilizer, usually growing well with 1 teaspoon of 21-0-0 fertilizer for each 1 square foot applied when new growth emerges and again in midsummer. Scatter the fertilizer evenly around the plants, dig it into the top soil layer and water well. If you harvest chives frequently, fertilize the plants every three to four weeks during the growing season with an organic fertilizer such as fish emulsion. Mix 6 tablespoons of fish emulsion into every 1 gallon of water used, and soak the root area with the solution. Check the packaging as rates vary among brands.